•	Support children in their experiences of violence, through individual and group programming. •	Support women in the impact of violence on their children, parenting and navigating the legal and child welfare systems. •	Act as child advocate and resource person on issues of sexual abuse and domestic violence. •	Provide to women and their children options, referrals and connections to community resources. •	Provide individual and group support; programming, advocacy, accompaniment, administration, security and maintenance; specific to children and youth program. •	Provide crisis intervention and crisis counselling services to callers and residents. * Specialized training in sexual and domestic violence counselling, including childhood sexual abuse issues. * Specialized knowledge of trauma, mental health and substance abuse issues. * Demonstrated knowledge of child development, effects of exposure to violence on children and parenting strategies. * Working knowledge of current community resources. * Second language highly preferred. 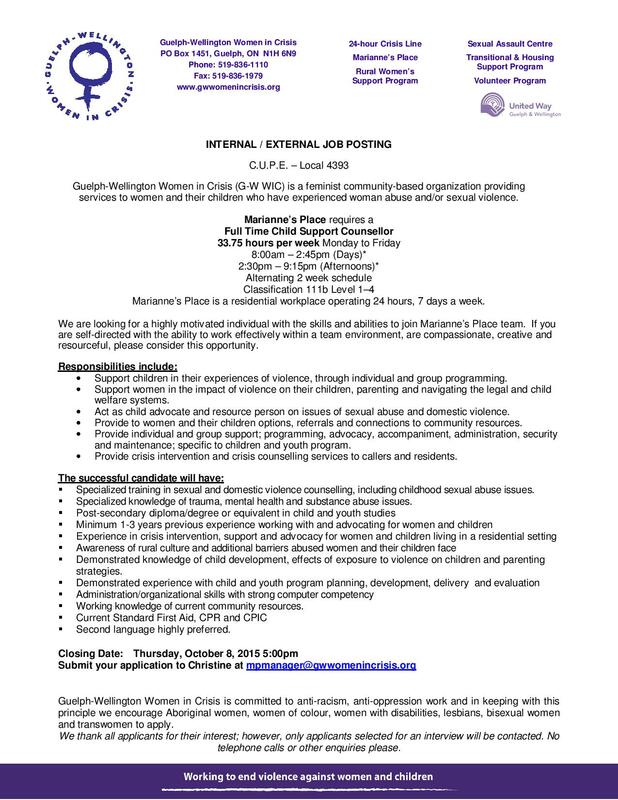 Guelph-Wellington Women in Crisis is committed to anti-racism, anti-oppression work and in keeping with this principle we encourage Aboriginal women, women of colour, women with disabilities, lesbians, bisexual women and transwomen to apply.